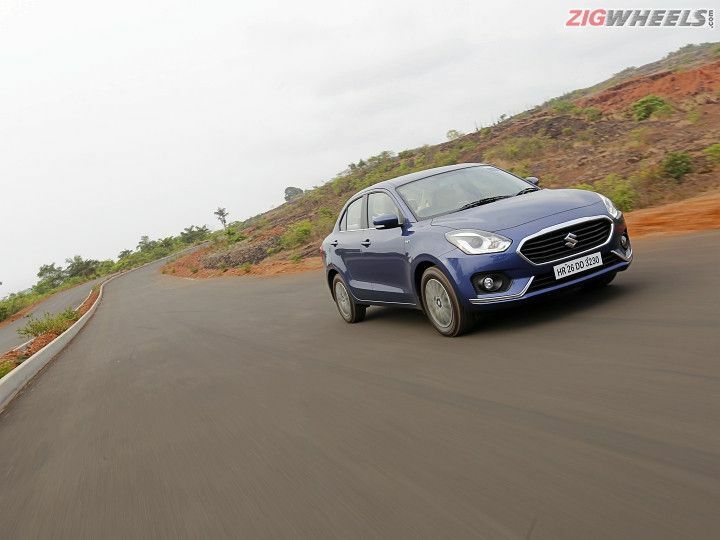 Is the new Dzire a better balance of form and function than its predecessor? The countenance is purposeful with muscle at the right places on the bonnet and the wheel arches. The hexagonal front grille is also short and wide, and it all adds to make the Dzire look broad. Chrome work is generous on the front grille, below the fog lamp housing and even in the headlamp unit, but it doesn't look overdone. In fact, the quality of chrome is so good that it would match the finish on cars twice its price. Unfortunately, Maruti Suzuki offers LED projectors and DRLs on the top ZXi+ variant only, so the lower variants get reflector headlamp units that tone down the aggression a bit. Unlike the front design that imparts the Dzire a big-car appeal, the rear is usual business as far as compact car designs go. Nonetheless, it is a step forward as the boot is now better integrated into the C-pillar and doesn't look like an afterthought. It's stubby with the bumper hardly extending any mass beyond the boot lid. The arc-shaped lip is Ciaz-like now. Importantly, the Dzire now not only looks proportionate but is also pleasing to the eye. The Dzire's cabin makes you feel that the car is built around you no matter where you are sitting. The driver's seat is comfortable with adequate under-thigh support and side bolstering; both marked improvements over the previous-gen. Thoughtful touches like a slightly tilted (towards the driver) infotainment system, chunky flat-bottomed steering wheel with recesses at the right places and easily readable white-backlit instrument cluster make you feel at-home driving the Dzire. Start nitpicking, and the two things you'd miss are centre armrest and dead-pedal, but the ergonomics are so sorted that you may let them go off without complaining. Get into the rear seat, and the Dzire continues to make you feel special. There is acres of room inside, and the credit goes to the new platform and some really intelligent space utilisation. The wheelbase of the new Dzire is up by 20mm, but Maruti says that the rear legroom has increased by 55mm. Forget numbers, the Dzire's back seat is unbelievably spacious, so much so that for an instance you might even forget how compact this car is on the outside. Rear legroom in a small car is generally inversely proportional to the seat width, but having spent quality time at the rear, I was happy with the overall experience. The seats are well sculpted too and offer just the right amount of bolstering. You sink into it ever so slightly, and the back angle is set to a position that is neither too upright nor too inclined. The rear is, however, best for two people only. The seat-back cushion is slightly lifted in the middle, and the centre armrest too makes for a relatively hard seat back. Transmission tunnel also eats up some space and three at the rear brush shoulders. Short rides will, however, be manageable. Maruti Suzuki deserves a big round of applause for offering six automatic variants in the new Dzire. The AMT tech not just offers gearless convenience but also doesn't compromise fuel economy, and of course, keeps the sticker price in check too! With multiple automatic variants on offer, the Dzire AMT will be accessible to a wider set of buyers. The second-gen Swift Dzire too was equipped with an AMT paired with the diesel engine. Both the engine & the gearbox are carried forward in the new Dzire but are calibrated differently. This results in smoother gearshifts. So, while the AMT still takes its own good time to upshift or downshift, the cabin experience is slightly richer than before as the head nod that accompanied every gear change previously is now subdued, but it's still there. The 1.3-litre diesel engine makes 75PS of max power at 4000rpm & 190Nm of peak torque at 2000rpm. The continuous torque surge makes the diesel Dzire a great mile muncher with very less downshifts required to make quick progress. When out on the highways, it's best to use AMT in the semi-manual mode for downshifting to time the overtakes better, and also to hold upshifts and utilise the power band to spring back to three-digit speeds. In normal driving conditions the AMT is keen to upshift early. The artificial intelligence prompts the ‘box to upshift below 3000rpm on medium throttle input. It does, however, hit the redline before upshifting with the A-pedal completely depressed. The AMT's party trick is the creep function which allows you to pull the car forward from nought in the second gear. It's like moving in traffic on half a clutch. Try doing that on the manual Dzire to realise the importance of an automatic. So, while the diesel manual Dzire should continue to munch miles, the AMT-diesel is now better suited for frequent city spins. But the powertrain of the moment should go to the petrol-AMT combination. The 1.2-litre (83PS, 113Nm) petrol engine is a refined unit, and it was there on-duty in the Swift Dzire as well. The engine is the same, but it comes with the 5-speed AMT now instead of the 4-speed torque converter (and there's a 5-speed manual as well). The drive experience of the petrol-AMT combination is plush thanks to low NVH levels and smooth gear shifts. The gear shift quality may not be as silky as in the Ignis petrol-AMT (same engine-transmission combo), but it won't give you a dramatic head-nod moment you'd associate with AMTs in general. Talking about the engine characteristics, there's torque on offer starting from low revs, and the band is quite wide as well. So, you can hold it in one gear higher without any resistance from the engine to downshift. The engine is also happy cruising all day long, with the 100kmph ticking at about 2800rpm in the fifth gear and max torque range still 1400rpm away. The gearing is tall although the engine doesn't quite like to be revved to its limit. So, it's possible to go well past the three digit mark in the third gear, but that won't satisfy you as much as chugging it around its max torque range will, where it sounds the sportiest. On the whole, the Dzire is still focused on covering maximum distance using minimum fuel. The engines were already fuel efficient, and reduction in weight has further helped matters. That doesn't take away the Dzire's engaging-to-drive nature, especially diesel's, that shows eagerness to roll on thanks to the turbocharger unit. The petrol engine also has a new role to play now, and that is to offer a superlative drive experience owing to the AMT two-pedal tech and high refinement levels. If I were to rate the most significant high points of the new Dzire, its ride comfort would come a close second after its interior space; it's that unbelievable. Three key areas show significant improvement – the damping, the steering steadiness and robustness while tackling bigger potholes. The additional weight of the diesel Dzire lets the suspension setup deal with road uncertainties with aplomb. The characteristic can be experienced at both low and high speeds, and it ups the plushness of the cabin. The steering is also steadier now in and maintains its centre position when going over rough patches without much driver effort, which builds the driver confidence. The third, and the most common of the complaints associated with Maruti cars – that of crashing into the potholes, has also been addressed. The Dzire goes over uneven surfaces and even bigger uncertainties without any harshness. The new Dzire is built on Suzuki's Heartect platform which is more rigid than the one on which it was based before. Apart from it passing the crash tests, it also improves the stability. The Dzire feels more planted now than before at speeds closer to three digits. While the platform makes it stable, the steering starts to get lighter with an increase in speed and makes it a nervous handler. At low speeds, the same steering feels better weighed. Braking is one department that doesn't see any improvement. The Dzire still lacks the initial bite, and speed sheds only when you press the B-pedal hard. So, while the Dzire maintains composure under hard braking, it's still not confidence inspiring. The new Dzire is certainly a significant improvement over the previous Swift Dzire, but the decision to offer the option of AMT in three variants (V variant onwards) with both engines can be a game changer in the budget sedan segment. It makes the Dzire the most fuel efficient automatic sedan and also one of the most affordable automatic sedans on sale in India. The Dzire petrol AMT starts from Rs 6.76 lakh and goes up to Rs 8.41 lakh. The Dzire diesel AMT starts from Rs 7.76 lakh and goes up to Rs 9.41 lakh (all prices ex-showroom Delhi). Maruti Suzuki has widened the appeal of the Dzire by having ironed out the major shortcomings of the previous Swift Dzire – interior space and looks. The new Dzire looks premium inside-out and has enough equipment to match its appeal. Undoubtedly, the price has gone up too. However, the lower variants are still competitive and it now comes with ABS and airbags as standard. The higher variants bring with them a sense of affordable luxury and carry the burden of filling the void that the Ciaz has left in Maruti Suzuki showrooms. Needless to say, the Dzire looks promising to fill it. The Dzire looks in shape to take off from where the Swift Dzire left. There are niggles but only for those who nitpick. The new Dzire looks ready to live up to its name, finally.